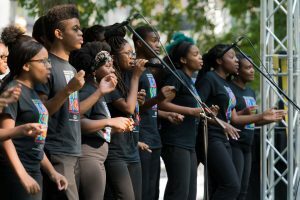 The Bicentennial Detroit Festival In Grand Circus Park West celebrated the university’s historical beginnings and its ongoing commitment to the city of Detroit where it was founded in 1817. As we live into the fundamental principles that make our partnerships thrive, our connections between Detroiters and U-M faculty, staff, and students manifest in hundreds of different ways — ranging from student organizations and social change projects, courses and K-12 programs, and community-academic research projects to business engagement and collaborations with City government and neighborhood organizations. Both our new and long-standing partnerships across disciplines, sectors, and geographic locations exemplify the breadth and depth of our continued work together.